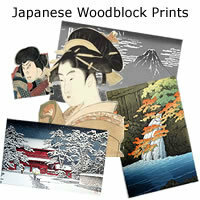 modern prints, offers by selecting excellent work in particular. 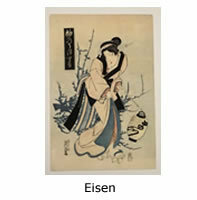 Each woodblock print draw a unique culture and beautiful scenery all over Japan along with the background of era, it has captivated viewers. the beautiful thing catches the heart of people in all times and continues still alive as scenery of the Japanese heart. 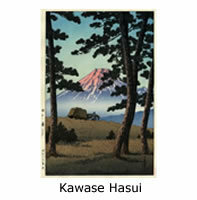 Once such amazing prints, please inflate the image of Japan to look in your eyes. Surely it will be something that comes through. we deliver the charm of a new woodcut in collaboration with contemporary artists. To you ! I will deliver what has been selected. "Dusk at Tagonoura Beach "
This is the one which was the boldly copied to the folding screen, of the woodblock prints of Fuji Thirty-six Views , Great Wave off Kanagawa by Katsushika Hokusai. There is a deep luster used the old silver foil which has passed through the era. 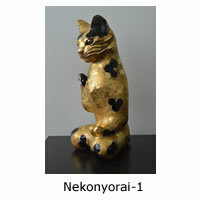 Sakai Jiro "Neko_nyorai 1"
to suit Japanese tastes and needs. In the Muromachi Period (1392-1568), as screens became more popular and common, the Japanese applied their own developments to the traditional Chinese design. painting can flow from panel to panel. and washi paper as the covering. 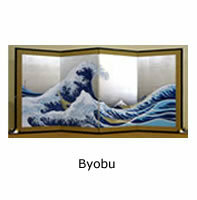 Screen making has been an industry in decline ever since the late Edo Period. or even imported from China. The maker of our screens, Iohara Seijudo in Kyoto, is a part of a family-run business now in its third generation. to finish entirely by hand. See our guide to the making of screens for an overview of the manufacturing process. We're glad to make your acquaintance. Thanks for visiting Live Art Session! LAS began with the encounter with an American painter in 1992. We were younger in those days but now became mature women a little. LAS is being operated by such three women. Moved to the ancient city Kyoto from the big city Tokyo , and then came to the forest of the Lake Biwa National park of Shiga surrounded with rich nature.From the beautiful forest, Live Art Session provides pleasant works of crafts and Japanese prints etc. Our English is not perfect, but we are kept in mind to handmade website. We hope that you are able to understand such our English. Thank you!